That’s when I—politically—fell head over heels for a player who we have since learned time and again is fearless on and off the field. Whether fighting for equal pay in soccer or advocating for LGBT rights, Rapinoe has been on the front lines of the sports world: straight, no chaser. This is why Megan Rapinoe would have been a safe bet to be the first white pro athlete to take a knee in solidarity with San Francisco 49er Colin Kaepernick’s National Anthem protest against police violence. Already, NFL players Eric Reid and Jeremy Lane—who are African American—have joined in, taking some of the weight and shouldering a portion of the violent vitriol being thrown Kaepernick’s way. Although a number of white players—and even coaches like Seahawks Pete Carroll—have offered verbal support of Kaepernick’s right to protest, none have supported either his cause or taken that knee. Then on Sunday, we had Rapinoe. As the National Anthem played before a National Women’s Soccer League match between the Chicago Red Stars and Rapinoe’s squad, the Seattle Reign, there she was on one knee. 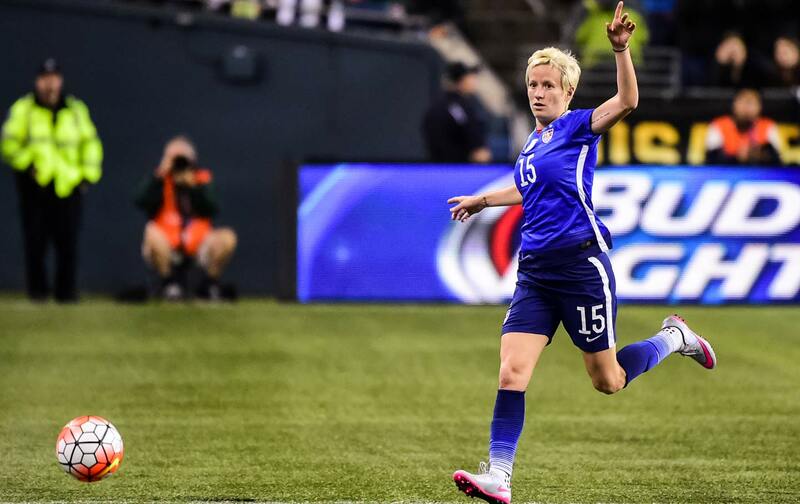 But even far more impressive—and useful—than Rapinoe’s action were her stated motivations. As with Kaepernick, the rage that Rapinoe has provoked was immediate and ugly. In addition to the usual online bigotry brigade, American Soccer Now held an online poll where people could vote on whether Rapinoe should be kicked off of the US National team. Their anger—and threats—may be intense but they also lose their undistilled potency when racist rageaholics have to go after multiple athletes at the same time. That’s why solidarity from other people in the sports world—particularly white athletes—matters. Rapinoe’s action raises an implicit challenge for those white athletes who are supporting Kaepernick to show their solidarity more publicly. The quarterback’s stance has morphed in front of our eyes from an action against police violence to one that raises the question about whether athletes have the freedom to speak or if—as many clearly believe—they signed away that right with their contract. As Santa Clara police threaten to refuse to do security for 49ers games and online hatemongers froth in a full frenzy, the need for athletic allyship becomes all the more apparent. One thing is clear: Rapinoe’s action ensures that this isn’t going anywhere and that Kaepernick’s words and deeds are having an impact that seems to be growing with every ugly attack from those who think that those who play sports and also face oppression should be seen and not heard.